Movie sequels, almost without question, have a quality inversely proportional to the number of films that precede them in the series. Video games, fortunately, routinely buck that trend. However, the literary gymnastics required to pull off a chain of sequels, prequels, inter-quils, alterni-quels and the other host of ploys developers use to desperately milk their cash cows after the udder has long since dried up and broken off has a tendency to some creative game numbering. As if “Final Fantasy II” didn’t epitomize nonsense in titling, the series eventually moved on to things like “Final Fantasy X-2“ and “Final Fantasy XIII-3.“ Having recently finished Assassin’s Creed: Brotherhood, which comes sequentially after Assassin’s Creed II but still two games before Assassin’s Creed III, I often have to throw aside any suspension of disbelief that these people can title a game more meaningfully than Mary Poppins song lyrics. Probably the prime example of this comes from the Metroid games. 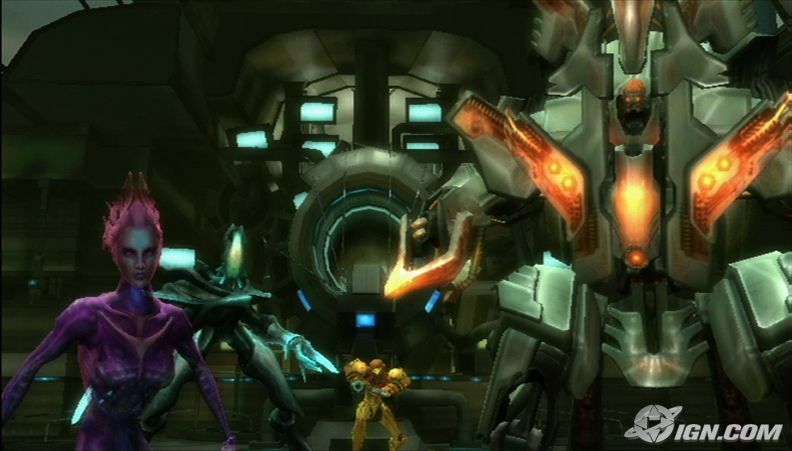 This week I’ll talk about Metroid Prime 3: Corruption, the tenth game in the series which takes place as the fifth or sixth game chronologically (depending on how you interpret the original and Zero Mission), and fourth in the Metroid Prime trilogy. Wrap your head around that while watching the Lion King 1&1/2. Explain how a monster that, in 8 bits, looked like a demon child with down syndrome turns into a creature that Samus can only smite Gandalf-style. 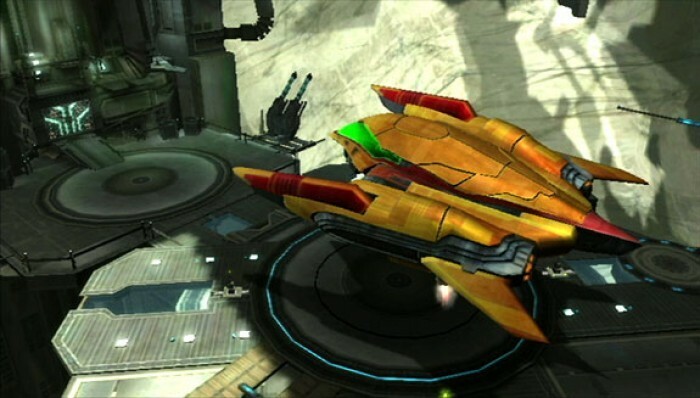 Corruption immediately stands out as different from the rest of the series by having cut scenes (although disclaimer: I haven’t played Echoes yet), thus trying to have some semblance of storyline other than shreds of information given in instruction manuals and plastered on Metroid Wiki pages. The story begins, as usual, on a space station that will shortly swarm with space pirates. Samus, with the help of her bounty hunter friends, fight back. Recurring dragon-pterodactyl Ridley shows up, challenging Samus to a Balrog-style duel as the two of them plunge indefinitely into a dark yawning chasm. Just as Samus and Team come close to saving the day, Dark Samus shows up and infects them with large amounts of phazon. A month later, Samus wakes up, and rather than receiving the proper medical care due to a combat veteran coming out of a 30-day coma, the Galactic Federation forces tell her they’ve harnessed the phazon in her body for use in battle, and oh, by the way, wouldn’t she kindly go and hunt down the other bounty hunters who may have gone insane from the effects of phazon? Samus’s posse. She gets a posse in this game. Unfortunately, while I generally prefer detailed story lines in games over all else (to the point where I have played Xenosaga Episode I several times), it doesn’t fit Metroid. At least, not the way they did it. Rather than playing as the super-awesome solo bounty hunter single-handedly fighting her way through planet Zebes, Corruption portrays a Galactic Federation Military who must have exclusively recruited from the ranks of the Gotham City Police Department. Each new transmission relays an objective that would convey less risk if Samus had, say, a highly trained team of space soldiers to aid her, but for some reason, they all want her to do this herself. Trying to portray her as a silent protagonist, she comes off not just a little festering and resentful. Upon starting the game, the player will first notice the nausea. While generally I don’t get sick playing first-person games, the notoriously precise Wii controller has a habit of zipping the view around unexpectedly, or losing contact with the sensor and leave Samus twirling in circles. Fortunately, I adjusted to this after about two hours of playing, but the first-person perspective may not always provide the most realistic game experience. 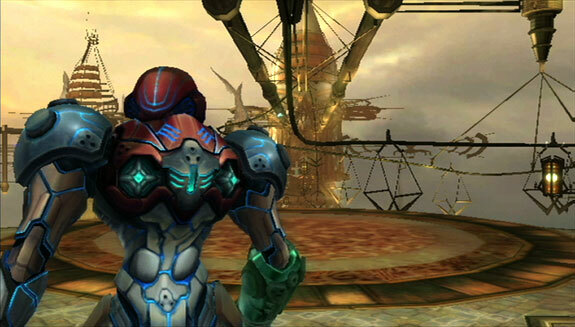 Judging from the exploration aspects that the original games shared with the Legend of Zelda, one might think that a 3rd-person over-the-shoulder view would work as well for Samus as for Link (They picked that perspective for Ocarina of Time, apparently because they thought players would want to see a cool character like Link. I guess Samus probably also gets paid 70% of what the male video game heroes make as well…) Still, that brings up another issue I had with the game–the decreased focus on adventuring and exploration. Not many games give you the option of ripping the life right out of your enemies. This one does. 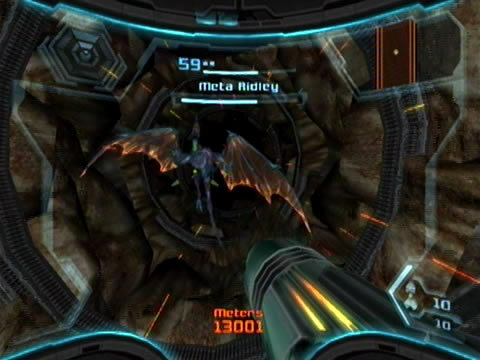 The first Prime game takes place immediately after the original Metroid. So it makes sense that Samus has her high-jump boots and morph ball and missiles (even if it doesn’t make sense that she has the grapple beam, space jump, and plasma cannon). However, early-game disaster naturally strips her of all the weapons, armor, and bonuses in order that she can start over again, making for a cliched story, but a satisfying game. In Corruption, that doesn’t happen. She begins with the morph ball, bombs, space jump, and a form of the grapple beam, and just keeps them. This sends Metroid on a trend like the Legend of Zelda. Items in both series originally helped characters reach new areas, fight enemies easier, and improved movement. Once activated, the player could use them creatively at any point on the map. Now, items have much less pizazz. They have specific uses, interacting with easily-identified objects in the environment, and only have a worthwhile use at those spots. It makes new items much less exciting to gain, and raises questions about why so much of the galaxy’s architecture favors inhabitants with morph balls and bombs at their disposal. Can everyone morph? If so, why don’t we see anyone else do it? Why can’t we find store fronts filled with morph balls? Oh, hell no! Platforming…my arch-nemsis. The game borrows the central hub idea from Metroid Fusion, except that you travel to different planets to reach new areas, and while in Fusion you began to discover that each sector of the ship connected with the others, you can’t get that unfolding sense of lost-in-a-labyrinth horror you get from the atmosphere of the 2-D games. (Taking into account the series connection with the “Alien” movies, introducing non-aggressive characters also takes away from the sense of loneliness). And of course, the super-detailed environment, while graphically impressive, sometimes feels like playing in a magic eye picture, forcing you to stare at it for hours before seeing the supposedly simple tasks the designers wanted you to notice. They offer you a map, but the 3-D stylized blocks they give you works about as well as solving a rubik’s cube blindfolded. Twisting, zooming and panning through it reveals nothing more than a sense of throbbing astigmatism. I don’t want to give the impression that I didn’t like the game, though. In fact, I thought the Wii controls drastically improved the Prime series, and (for a while at least) I got no small amount of pleasure from ripping the fixtures off of walls with my grapple beam. Boss battles became a little repetitive in this area, though, as most of them require shooting at obnoxious, fast moving targets in order to reveal a weak spot that would stun the boss long enough to rip off a segment of armor so you could switch into hyper mode in order to actually deal damage. 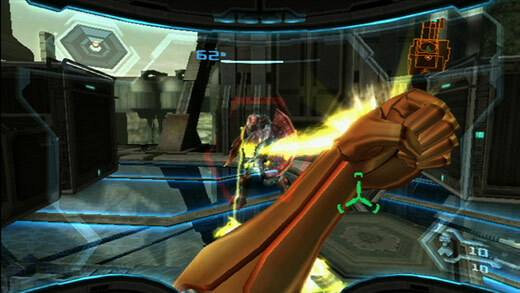 Hyper mode–attainable because of Samus’ phazon infection–added nice features to the game, allowing overpowered blasting, shooting, and electrocuting when whittling enemies down with the charge beam got too boring, and unlike other games’ super modes, you can switch into it at any time (at the cost of some life energy), rather than just when you fill up a gauge or collect enough items or take enough damage–in most games, this usually happens just after I finish a boss or other section where such a bonus would actually benefit me. Other than your ship, the game gives you about one save station per planet. Prepare yourself to lose hours of progress. 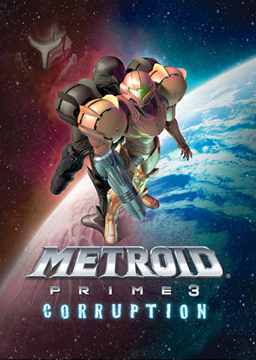 Metroid Prime 3: Corruption can’t really compete with the 2-D Metroid games, especially Super Metroid, Metroid Fusion, and the original, but it does offer some satisfying aspects, and offers a nice challenge without sending you scrambling for a walkthrough every other room. Still, I may write to Nintendo and demand back all the hours of my life wasted from stupid deaths because they only give me one save station per planet. This entry was posted in Metroid, Uncategorized, Wii and tagged Metroid, wii. Bookmark the permalink.